I have received requests me to blog a detailed post on idli recipe with tips on how to make soft idlis that are fluffy and melt in the mouth. I did post an idli recipe earlier on my blog but this time around, I am sharing an elaborate post with step by step photos. Let me mention at the outset two factors regarding the making of idlis at our home. 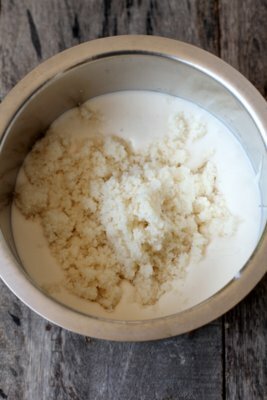 I use idli rava (cream of rice) instead of parboiled rice or idli rice and I do not use a wet grinder for grinding the idli batter. 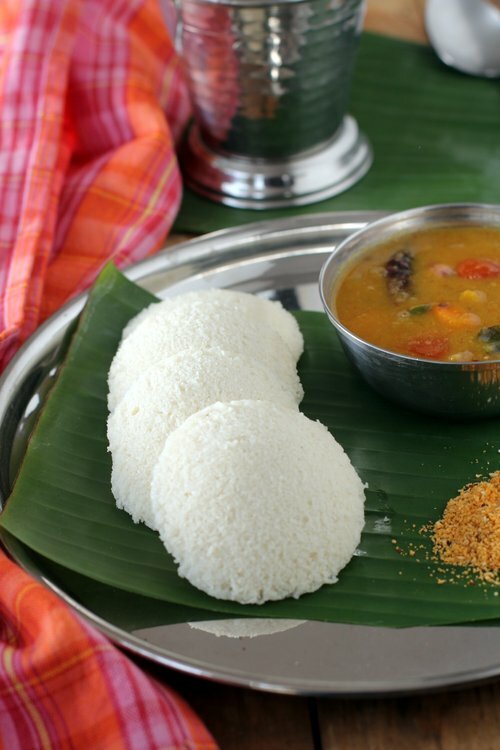 In most Andhra homes, idli rava is preferred over idli rice. If you are looking for an idli recipe using idli rice or parboiled rice, I will blog it over the next few weeks. 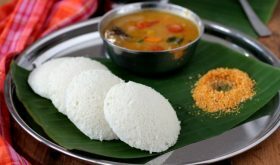 Idli is one of the best breakast recipes from India and its a popular tiffin item in our home. Idli is basically steamed rice cake prepared with fermented batter of rice and black gram dal. 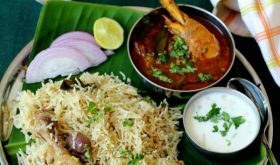 It is a popular breakfast food in the four states of South India since its light on the stomach and easy to digest. We make idlis at least 3 to 4 times a week either for breakfast or an early dinner. The best side with idli is tiffin sambar followed by coconut chutney and idli podi smeared with a dash of ghee or gingelly oil. Having said that, idli tastes equally good with a variety of pachadis and podis. 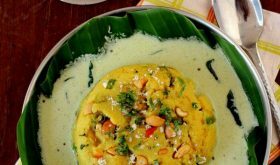 Idli recipe Andhra style – I am sharing a few tips to follow while making this idli with idli rava. 1) The quality of urad dal used to make idli is extremly important. I cannot emphasis enough the importance of fresh, high quality whole skinned ural dal. If you use good quality urad dal, you are sure to make perfect soft idlis. 2) I use a mixer grinder to make my idli batter and it works out perfect. 3) I use my hand to mix urad dal batter and idli rava instead of a spoon/ladle. It ensures better fermentation. 4) If you are using refrigerated idli batter, always bring it to room temperature, add salt and mix before spooning it into the moulds. 5) Proper fermentation is essential. In tropical countries like India, fermentation is a breeze. During summers, less than 7 hours is enough for the batter to ferment while winter it might take 10-12 hours. 6) In extreme cold climate, its advisable to place the batter in an oven with the light on. It might take more than 15 to 20 hours to ferment. 7) Idli rava is not to be mistaken for rice rava or coarsely ground rice (called biyyam rava in telugu) or sooji aka semolina. 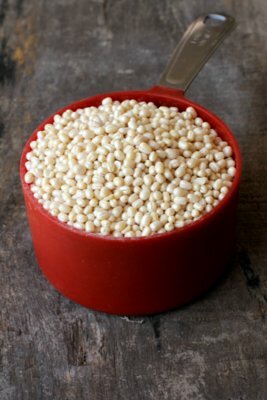 It has a finer and softer texture compared to semolina though it looks similar to fine semolina. It absorbs a lot of water during soaking so ensure you squeeze out the water completely from the idli rava before adding it to the urad dal batter. 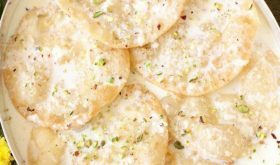 a) “why are my idlis sticky” – if you add too much water while grinding the urad dal, you will have a very flowy batter yielding sticky idlis. The batter has to be just right, neither too flowy nor too thick. b) “why are my idlis hard” – if the urad dal batter is too thick, it will yield hard idlis. Also do not beat the fermented batter too much. Just mix lightly 4 to 5 times. Over steaming or over cooking of idlis can yield hard idlis. When the quantity of urad dal is less in proportion to the quantity of idli rava, it yields hard idlis. c) “why are my idlis flat” – if you add too much water while grinding the urad dal it will result in a watery batter yielding flat idlis. When the quantity of urad dal is more in proportion to the quantity of idli rava, you will get flat but soft idlis. d) “how to ferment idli batter” – use your clean hands to mix urad dal batter and rice rava in a stainless steel vessel. It aids in fermentation. Place the lid and keep the vessel in a warm area of your kitchen for at least 8 hours. It may take 10-12 hours for fermenting during winter. In very hot climatic conditions, fermention takes less than 7 hours and it will turn sour if you ferment it beyond 7-8 hours. Once fermented, refrigerate till use. For very cold climates, I’d suggest you cover the vessel with a thick woolen cloth or shawl and place it close to your cooking zone. Those of you who have an oven, switch on the light and place the batter in the oven. Do not preheat the oven. Just switch on the light of the oven and the heat of the light will aid fermentation. e) “how to know if idli batter is fermented” – the fermented batter will increase by atleast 50% of its original volume with a distinct fermented sour smell. It will be light and foamy and as you spoon the fermented batter and pour it into the idli mould, it will fall like a blob. g) “why is my idli batter not fermenting” – it could be due to a couple of reasons like cold weather, bad quality urad dal or idli rava, loose or runny idli batter and incorrect ratio of urad dal and idli rava. h) “how to know if idli is cooked” – wet your finger and touch the top of the idli, if it sticks, you need to steam it further. If it does not stick to your finger and a toothpick or knife inserted into the idli comes through clean, it means the idli is cooked. In a separate bowl, soak idli rava in water for half an hour (soak half an hour before mixing with the ground urad dal batter). Drain water from the soaked urad dal and place half of the soaked dal in the mixer grinder and add few tbsps of the cold urad dal soaked water. Grind the urad dal. During the grinding process, keep adding a few tbsps of the cold water and continue grinding. Add the cooked rice while grinding. Grind till it is soft and fluffy. Feel the batter between your fingers and it should be super soft on touch. If it is coarse, continue to grind it till you achieve a smooth flowing batter that is not too thick nor too thin. After grinding you will find small bubbles appear on top, it means you the batter is aerated with a smooth consistency. Remove the ground batter to a large stainless steel vessel as the batter will increase by 50% of the original volume on fermentation. Add the remaining urad dal to the mixie and grind following the same process as you did the earlier batch of urad dal. Remove this ground batter to the stainless steel vessel. You will need approximately 1 1/2 cups of water to grind a cup of urad dal. Squeeze water from the soaked rice rava and add it to the ground urad dal batter and use your hand to mix. The urad dal batter and idli rava should mix well. Once mixed, place lid. Place the mixture in a warm place for 8-10 hours or overnight to let the idli batter ferment. The fermentation is slow in winter and quick during summer. 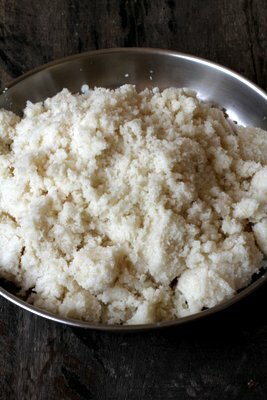 The key to soft and fluffy idlis is in the fermentation process. After 8 hours you will find that the mixture will rise to 50% of the original volume. Add salt and pinch of cooking soda and mix gently with a ladle. Do not over beat. The batter is now ready to make idlis. Pour 1 1/2 to 2 cups of water to the idli maker or pressure cooker and place the idli stand in it. Turn on flame and heat the water to almost boiling point. While the water is heating, wash the idli plates and lightly grease them with oil. 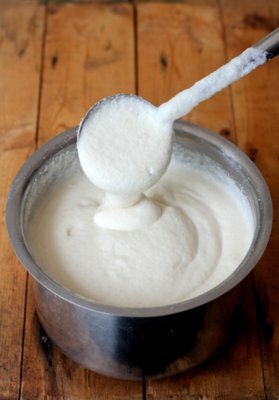 Spoon the idli batter using a small ladle. Do not add too much batter as it will increase in volume on steaming. Place the idli stand in the idli steamer and place lid. Do not use the cooker weight if you are using a pressure cooker. Steam on medium high for 12-15 mts and turn off flame. Do not open lid for 8-10 mts after turning off the flame. Remove the lid and the idli stand from the idli maker. Wet a spatula or a knife and carefully remove each idli and place in a bowl. 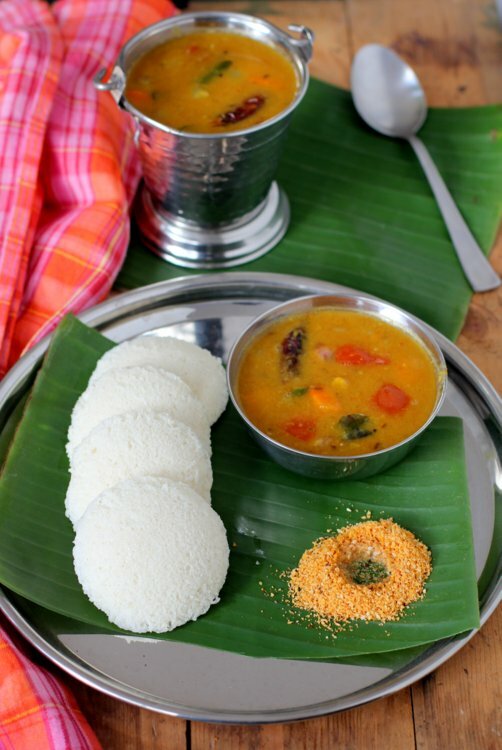 Place steamed idlis in a bowl and serve with sambar, chutney and podi of your choice. Those of you who do not have the idli plates or idli cooker, you can use a flat bottomed wide heavy vessel to make idlis. Add 2 cups of water to the vessel and allow to heat on low flame. Invert a round shaped cake tin on the base of vessel. Take another round shaped cake tin, lightly grease it and spoon in the idli batter till half full and place a lid. Do not fill to the brim as the batter will rise on steaming. Place this vessel on top of the inverted cake tin. Place lid on the flat bottomed wide vessel and steam for 15 mts on high. Turn off flame and allow to cool for a few minutes before removing the vessel. Run a knife along the sides and cut into square pieces and serve warm with chutney of your choice. If you want to make a large batch of idli batter and freeze it, follow these steps. Once the batter is fermented, gently mix it four to five times (do not add salt). 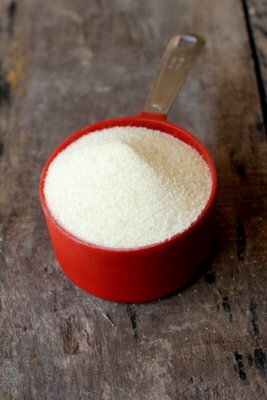 Remove the amount of batter required to make idlis and store the remaining batter (do not add salt or cooking soda) in an air tight container. Do not fill the batter to the brim. Place the container in the freezer. 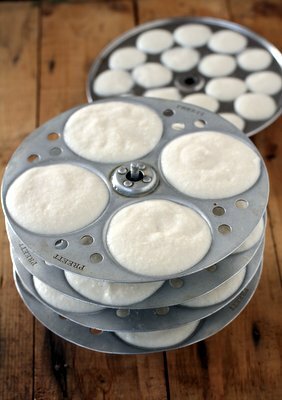 To make idlis with frozen idli batter, remove the container from the freezer and place in the fridge the night before. Next day, remove the container from the fridge and bring to room temperature, add salt and small pinch of cooking soda and gently mix and use as required. Dip the spoon or knife in water and then remove the steamed idlis from the moulds. This way you have smooth topped idlis. 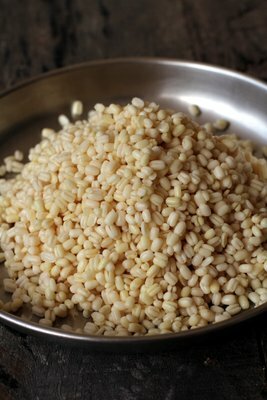 If you do not have cooked rice on hand, soak a fistful of flattened rice/poha in a little water and add it to the urad dal at the time of grinding. 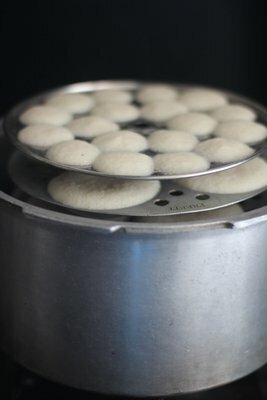 You can use an idli maker/steamer, pressure cooker or steamer to make idlis. Do not use the weight, if you use a pressure cooker. By Sailu Published: February 13, 2015 Idli Recipe with tips and step by step pictures. Perfect idli batter recipe using idli rava. Learn how to make soft idlis with idli cooker or idly maker. thanks for the detailed recipe Sailu. 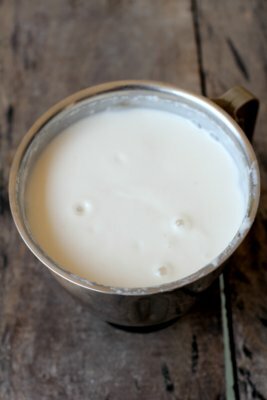 Another trick I use for fermenting or making yoghurt too in the US during the winters is to switch the light in the conventional oven and leaving the batter in there and usually in a few hours its done. Sailu is back!!! Was waiting for your blog to be updated. which brand of idli rava do you use? Hi Sailu, I am long time visitor of your blog. I tried many of your recipes, every time it turned around to a nice recipe. 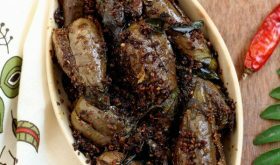 Thank you so much for your efforts in giving nice recipes. I have been seeing your blog under maintenance from quite a long time and i felt little sad. Please tell me what idli rava is ? as I have never heard of it. We do use semolina or Rutlang which is called rava for uppuma but never heard of rice rava. Please tell me what it is. I am from Sri Lanka. Idli rava is prepared from boiled rice. Coarsely ground boiled rice is called idli rava (cream of rice). Hello Sailu, glad to see you are back…hope you have been well. 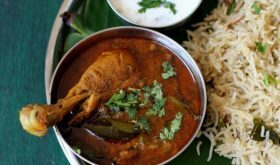 hello from Munich Sailugaru, Great to see you back with your wonderful recipes and awesome photos. 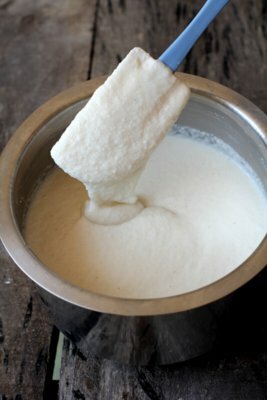 Can this same batter be used for making Dosa ?